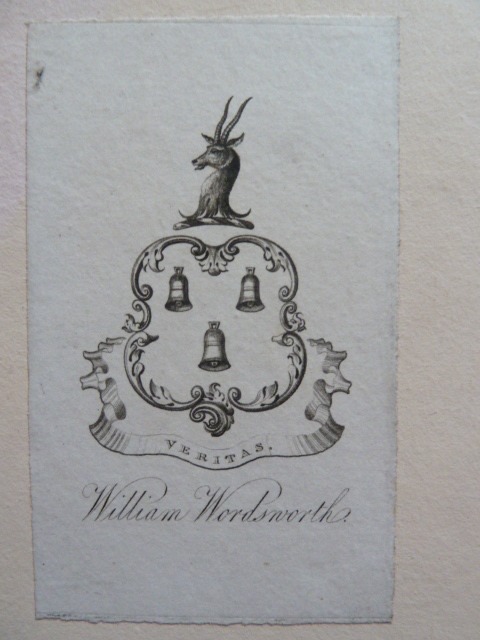 Barely had the ink dried on my recent musings on bookplates, when a visit to a local bookshop (one of the old school and one of the finest not just in this area, but in any area) turned up five volumes each bearing the bookplate of William Wordsworth, the books stated to be from his library at Rydal Mount near Grasmere in the Lake District, the poet's home from 1813 to his death in 1850. 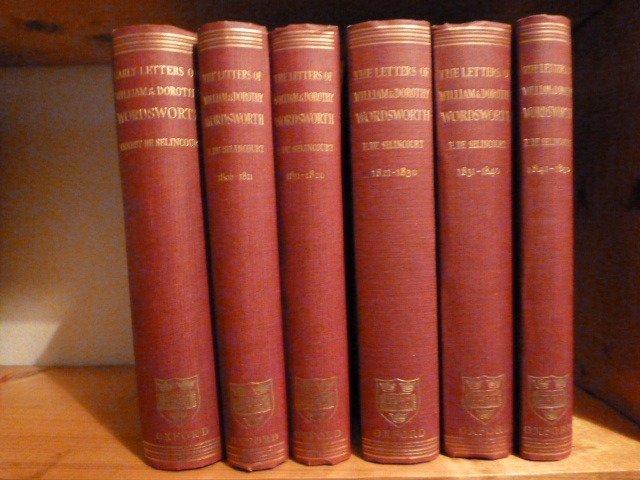 The five volumes were all published by Edward Moxon and dated between 1838 and 1846. 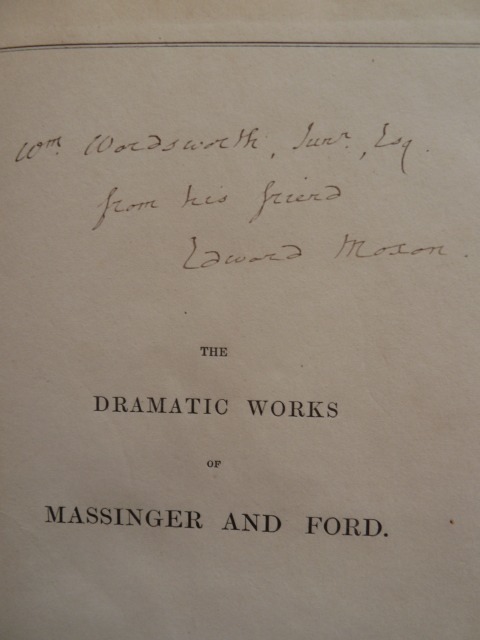 Further, four of the volumes contain a hand written inscription by Moxon presenting the books to William Wordsworth Jnr. (the poet's son). 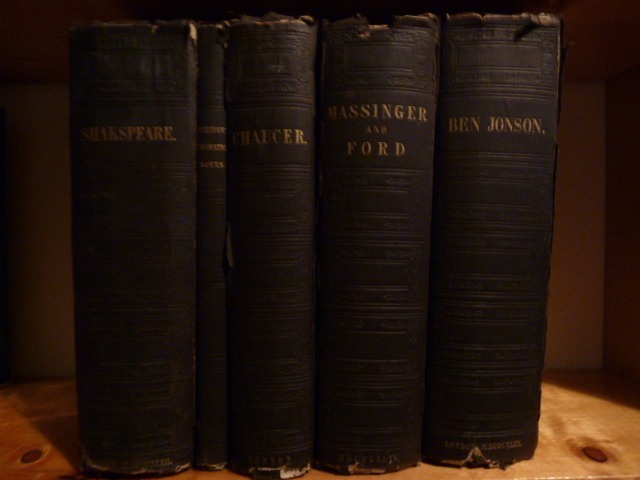 The volumes are Moxon editions of Shakespeare, Ben Jonson, Massinger and Ford, Chaucer and Sheridan. 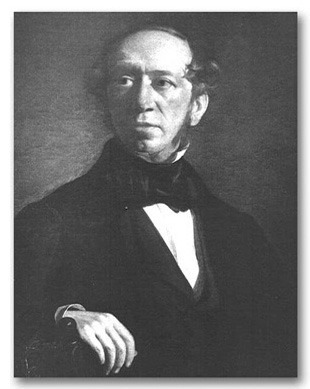 Edward Moxon (1801-1858) was a poet turned publisher, who started his own publishing business in 1830. 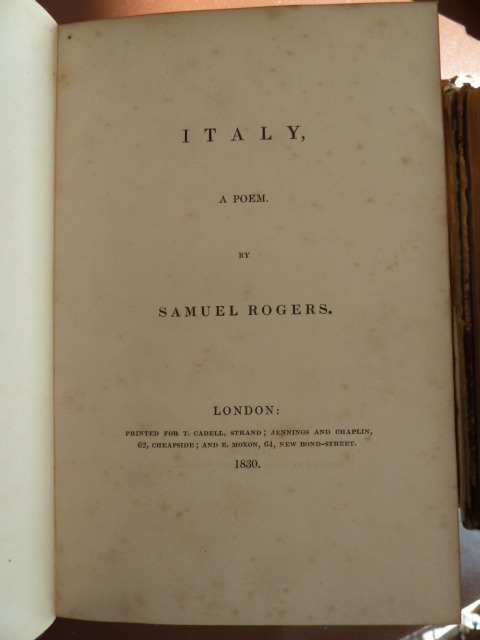 One of his early successes was an edition of Samuel Rogers' popular poem "Italy", with fine steel engravings by Turner. 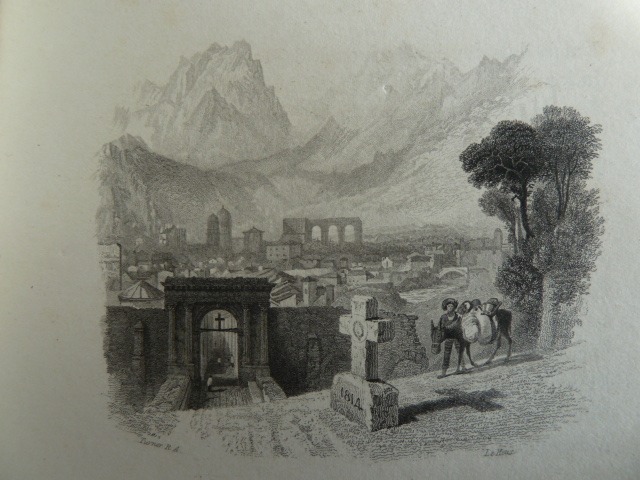 It was these engravings that the young Ruskin enthused about when he was given the book as a present. This was followed up by the equally fine "Poems" by Samuel Rogers in 1834. 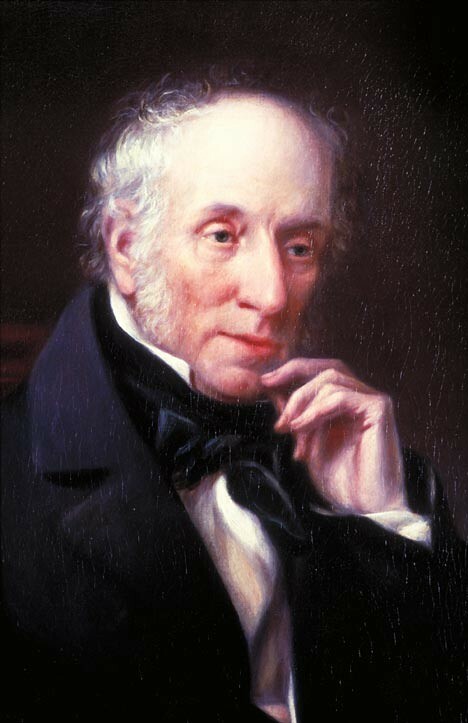 Wordsworth and Moxon were to become firm friends and in 1835 Wordsworth entrusted the publishing of his books to Moxon, which led to an increase in sales and more fame for both poet and publisher. 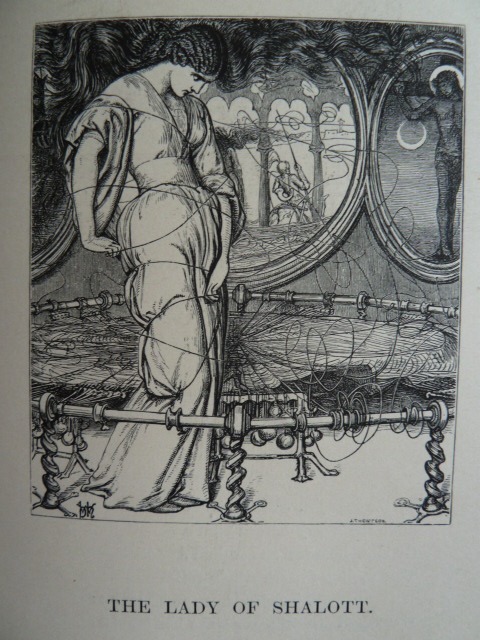 Moxon, from his publishing house on Dover Street, London, was now the publisher of choice for many poets of the day, including Tennyson, and it was in 1857 that the first edition of the incomparable "Moxon Tennyson" appeared with illustrations by the Pre-Raphaelites - Millais, Holman Hunt and Rossetti, their only collaborative book project. Moxon regularly stayed with the Wordsworths at Rydal Mount and the two travelled together to Paris on one occasion. Moxon also visited the Pyrennes with Wordsworth's children. The ageing Wordsworth must have recognised a kindred spirit in the energetic and talented publisher (very different, one imagines, from the publishers he had suffered before). "The parcel of Books arrived during my absence, and I have not yet had time to do more than glance at it. Mrs W began to thank you, which I do also, on my own part, for your kindness to my Son, who, we are most happy to hear, is shaking off the sad effect of his Fever." "Very many thanks for your valuable present of Shakespeare and Jonson, they are handsome books and I hope will repay you .."
So, there we have it - bookplates of England's finest romantic poet, presentation inscriptions to Wordsworth's son from the poetry publisher of the day and Wordsworth's fulsome thanks for the gifts in his published letters. A bibliophile's day to treasure. I think we ought to start emulating Wordsworth and putting important words in captitals - like Books (but as far as I'm concerned, not publishers). 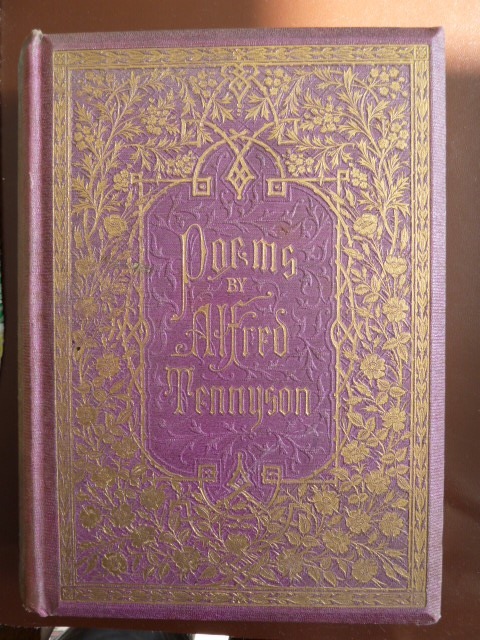 A small point on the "Moxon Tennyson"...it appeared as a first edition in 1857 not 1853 as stated.